Once you have edited your videos with best video editing software, you will definitely want to share it with your family and friends. 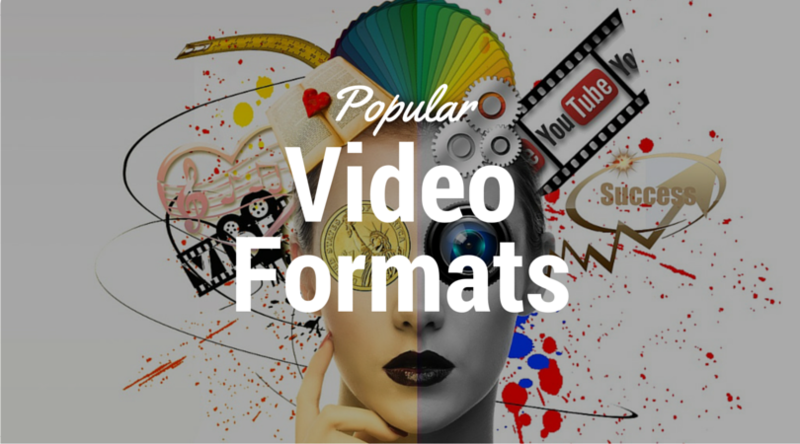 To save your videos for a specific situation, there are many file formats to do so. Mentioned below are video file format and corresponding situation best suited for them. This format is a new and famous version of Flash with its gaining popularity because of YouTube. Considered to be the most accepted online formats, it has two options: streaming and progressive download. This format works on any device which has Flash, from handheld devices to personal computers. Supported by a variety of players, this is the standard defined by the MPEG. With small file size and good quality, this format allows for added media components and interactive video. These files can be played on the smartphones with video support, iPod, PSP etc. AVI stands for Audio Video Interleave and its the standard video file format of Windows. It is supported by all famous browsers and PCs running on Windows. To play this file format on non-Windows computers, one can use the codec. This format is good for uploading to video sites like YouTube, Google Video, etc. and for computers. Commonly found on the internet, this format requires an extra component to play on non-Window PCs. Some videos in this file format can’t be played without having a particular codec. This file format works better on computers or devices which run on Mobile Windows OS. Microsoft developed this format. Being a contained format, there are different type of codecs one can use to compress the audio and video. QuickTime software is required to play these files in this Apple-specific format. The file size and video quality is dependent on the type of codec used. As videos in this format only play on QuickTime, it limits the audience number who can view the video. Developed specifically for the internet, it was developed by RealNetworks. The most salient feature of this format is that it works seamlessly well streaming on low bandwidth, but the quality of the video is compromised. To view files in this format, you will have to install extra software. So when you decide to save and share your videos in a particular file format, you should choose the formats which can run on many platforms and doesn’t need any particular obscure player. With this, we end our list of popular file formats. Let us know which file format you use most often.